The beauty of local languages is in the intimacy they evoke. The sounds, words and phrases are all a melody to the ear of the attuned. Cultural values, a people’s ethos and their prejudices are often not explicitly stated but rather, carefully handed down each successive generation through interesting proverbs and idioms. The ‘Dictionary of the Kashmiri Proverbs and Sayings’ by J. Hilton Knowles is one such treasure that aims to capture this. 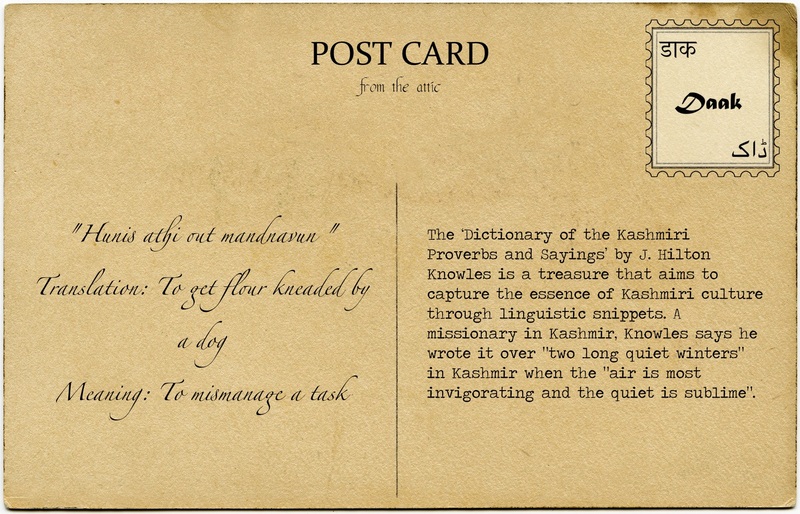 A missionary in Kashmir, Knowles says he wrote it over “two long quiet winters” in Kashmir when the “air is most invigorating and the quiet is sublime”. The ingenuity with which the Kashmiris, a once isolated population from up North, string their words and weave their tales is exceptional. For a primarily spoken language, Kashmiri has kept alive its repertoire of proverbs across centuries. Some that have their origin as far back as the 13th century can still be overheard amongst its people. It is no surprise then, that these proverbs have covered many facets of their culture. While this book is, in its essence, a dictionary and a somewhat academic compilation, a casual skim through it is most entertaining. We have selected some of our favourites for you. Background: Once a master gave his apprentice a fowl to kill and cook for him. The apprentice did as instructed but during the process, hunger got the better of him and he ate one of the legs. The master, furious upon discovering a piece of leg missing, screamed at the help. Being adamant, the man did not give in and insisted that the fowl had only one leg. Some time later, the apprentice spotted a fowl with just one leg and hurriedly called his master to in order to prove his innocence. The master picked up a little pebble and threw it at the fowl, who immediately stuck out its other leg to balance itself. Seeing this, the apprentice, undeterred in his cause, exclaimed that since the master hadn’t thrown a stone at the last fowl, it didn’t bring out its hidden leg. He still stuck to his story and therefore, this idiom is used in a situation where someone won’t give up. Background: A bear formed a friendship with a man who was passing through his jungle. For some time, he brought his friend large quantities of honey. One day the man fell asleep after eating the honey. While asleep, a bee, attracted by the sweetness, alighted upon his mouth. Seeing this, the friendly bear thought he would save the man from the pain of a sting, and so he went and fetched a great piece of rock and aimed with all this might at the bee. The stone frightened the bee but unfortunately killed the man. For more illustrated Kashmiri proverbs, check out this blog by us. The more you investigate, the more you will find imagery of proverbs replicated in other languages in the region. For more Indian language proverbs, see here. I have gone through the post cards. A unique and a laudable initiative. My late father was a philatelist and was deeply into letter writing, mostly snippets on post cards. He had a collection of postcards from the subcontinent. Later in life he either himself or got his painter friends involved in getting one side of the postcards painted and on the other side wrote lines from a poetry or Tagore’s songs beautifully etched in and sent to his family and friends. Love your sincere efforts. I would also like to contribute. My field of interest is painting, literature and classical music.